IT WOULD be churlish not to congratulate Leo Varadkar on his inclusion in Time magazine’s 2018 list of the world’s 100 most influential people, along with such varied characters as President Donald Trump, North Korea’s Supreme Leader Kim Jong-un and royal bride-to-be Meghan Markle. At least you have to give the Taoiseach credit for coming up with thought-provoking ideas. He recently suggested a special event to mark the 70th anniversary of the Declaration of the Republic, which came into effect on April 18, 1949. Speaking at Daniel O’Connell’s former residence on Dublin’s Merrion Square, now an Irish home to the University of Notre Dame, he called for a national debate on ways to celebrate the occasion. The Republic had already been declared in the 1916 Proclamation and in other circumstances also, but 1949 was the first time it gained international recognition. The Taoiseach wishes to involve other parties, although he might encounter some reluctance from the Fianna Fáil camp since it was a Fine Gael-led coalition that declared the Republic at the time. As Varadkar pointed out, the 1949 celebrations in Dublin were attended by tens of thousands. There were shouts of “Up the Republic” and dozens fainted from excitement. The city-center was transformed by a midnight display, involving searchlight batteries, and a 21-gun salute was fired from O’Connell Bridge. ‘Republic Day’ would be an interesting development. It could be tied in with the commemoration of the 1916 Rising, which also took place in April – indeed the Republic of Ireland Act took effect on Easter Monday 1949. Curiously, in the copy of his speech released to the media, Varadkar does not mention that at the same time an end was brought to Ireland’s membership of the Commonwealth and a resentful British government made Irish unity subject to the consent of the then-parliament of Northern Ireland. At the time, Fine Gael was widely-known as a “Commonwealth party” because it was in favor of retaining Irish membership. But leaving was a key demand for the second-largest participant in the government, Clann na Poblachta (“Republican Family”), led by former IRA chief-of-staff Seán MacBride. There were quite a few former Republican warriors in Clann na Poblachta, which also had a left-wing dimension with figures like Dr. Noel Browne. Comparisons with present-day Sinn Féin are inevitable, especially since the latter has expressed a keen interest in joining a future coalition government in Dublin, provided the terms are right. In that regard, it is worth reading the analysis by Maynooth University’s Dr. Adrian Kavanagh (https://adriankavanaghelections.org) who specializes in translating the latest opinion poll results into potential seats in the Dáil, which will go up from 158 to 160 TDs after the next election. Subject to certain cautionary provisos, he places Fine Gael at 62 seats with Fianna Fáil at 50 and, most interesting of the lot, Sinn Féin at 38, compared with 23 TDs last time. His conclusions are based on the latest Irish Times-Ipsos MRBI poll, which has Fine Gael at 31 percent, down three points from last time; Fianna Fáil at 26 percent, up one; Sinn Féin at 22 percent, up three. There is certainly a Mary Lou McDonald “bounce,” for the moment anyway, and her personal rating is 39 percent, compared to 27 percent for her predecessor Gerry Adams in the previous poll of the same series. Turning back to Clann na Poblachta, there are mixed views on whether the declaration of the Irish Republic was a good idea or not, but it does show the impact a minority party can have in government on issues related to the “national question.” Also, Dr. Browne’s role as health minister in tackling the TB epidemic was of major importance and had a huge public impact. 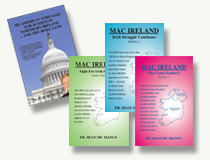 In the 2016 general election in The South, along with the predictable call for an island-wide referendum on unity, the Sinn Féin manifesto also included demands for MPs from The North to be accorded Dáil membership and speaking rights, as well as a constitutional amendment to extend voting rights to Irish citizens, in The North and abroad, in presidential elections. With a southern general election apparently looming, probably in spring next year, Sinn Féin’s prospects of gaining office look quite good, assuming Fine Gael or Fianna Fáil can overcome their reservations about the party and a mutually-acceptable deal can be negotiated. There are interesting times ahead. But like Maggie Thatcher, it seems the ‘Shinners’ are not for turning.